Lava flows in Leilani Estates. The Kilauea eruption that began last week shows no signs of slowing down. The lava lake on the summit of the volcano on the Big Island was overflowing last week before dropping more than 700 feet. People just stone cold chilling next to lava. No deaths have been reported, either. It’s a far cry from, say, the infamous 1980 eruption at Mt. Saint Helens, which killed nearly 60 people, sent ash flying into the sky and saw pyroclastic flows of ash, toxic gases, and lava rumbling down its flanks at up to 300 mph. Or even the light and ash show that Mt. Mayon in the Philippines put on recently. The reason Kilauea has been a relatively gentle eruption (and likely will continue to be so) has to do with both geology and chemistry. On the geology front, Hawaii is sitting in the middle of an oceanic tectonic plate. That plate is on the move, and it happens to be passing over a hot spot of magma below the surface. As it cruises over the hot spot, volcanoes have popped up on the surface, which is how we’ve ended up with the Hawaiian islands. The rock being melted to form that magma chamber is rich in iron and light in silica. In comparison, Mt. Saint Helens and other volcanoes along the Ring of Fire—a series of volcanoes circling the Pacific—generally occur where oceanic plates meet continental plates, the latter of which are rich in silica. That’s where the chemistry part comes in. Silica is the key ingredient for explosive eruptions. The lava lake on the summit of Kilauea has dropped more than 700 feet since fissures opened on its eastern flank. Silica molecules bond together, making the magma more viscous. Though it may seem counterintuitive, this higher viscosity is the ticket to more violent eruptions. More viscous lava traps more gas bubbles, allowing pressure to build up inside the magma chamber, which eventually leads to violent results on the surface. In comparison, iron-rich magma chambers are essentially able to burp themselves, releasing gas and reducing the risk of explosive eruptions. 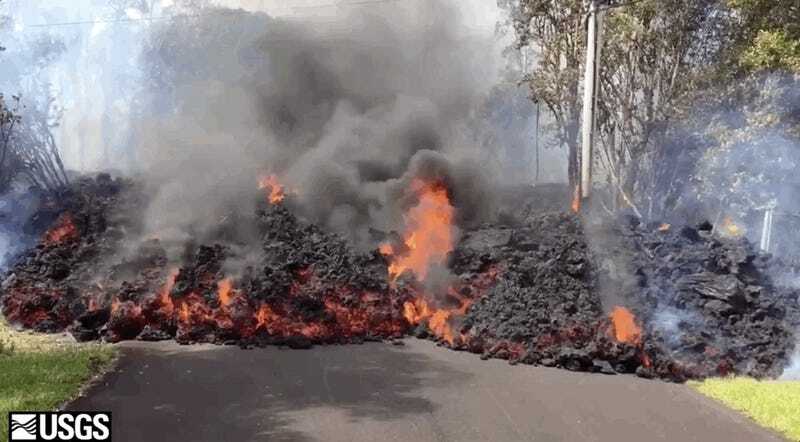 The basaltic lavas currently marauding across Hawaii only contain about 20 percent less silica than lavas composed of rhyolite, but the viscosity differences are immense. “Viscosity can differ from basalt to rhyolite by close to a billion times more viscous,” Erik Klemetti, a volcanologist at Denison University, told Earther. 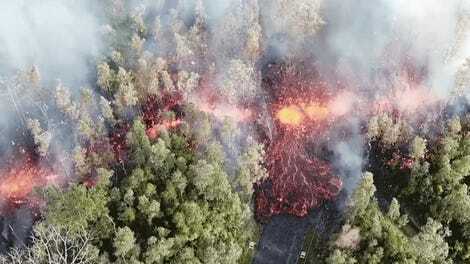 The U.S. Geological Survey reports that “seismicity and deformation decreased in the past day” in the East Rift zone, but tremors continue at the summit of Kilauea, indicating the action isn’t over yet. That means you can expect more epic drone shots and people getting close enough to the flows to make you recoil at the thought of being within feet of rock heated to 2,000 degrees Fahrenheit.